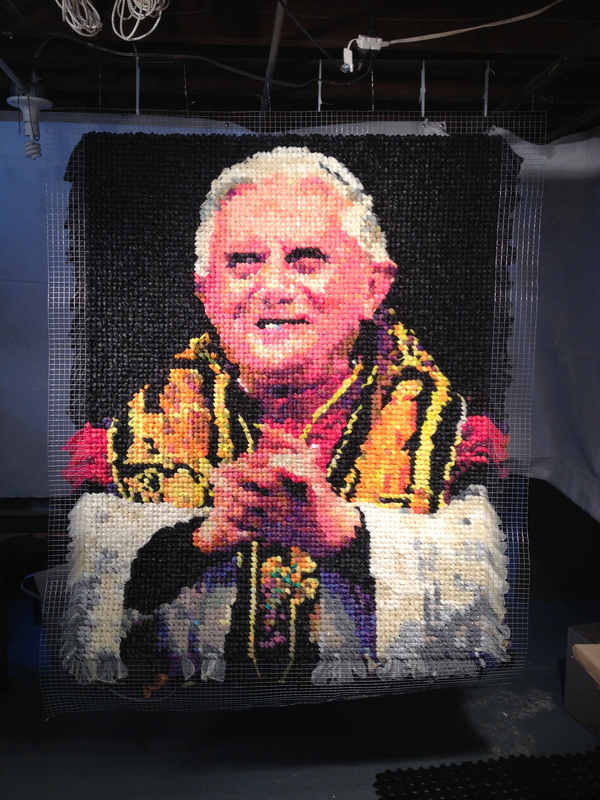 This entry was posted in Uncategorized and tagged 17000 condoms, AIDS, condom art, contemporary art, cross stitching, HIV, latex preservation, niki johnson, pixel art, Pope Benedict, prostitution, sexual health by Niki Johnson. Bookmark the permalink. What a remarkable artist you are, not only to create beautiful art, but to incorporate the times you live in as part of your amazing work!..Congratulations on a job well done! It is beautiful and ingenious, with an appropriate subject. Bravo!! Hi Niki, I’m a reporter with the Huffington Post and we’d like to do a story on this great project. Can you email me at megan.griffo@huffingtonpost.com? Thanks! dass ist nicht zu fassen. Welch wunderbares Exemplar für Schüler, um die Farblehre durchzunehmen. Mein Respekt und meine Hochachtung ist dir sicher, sowohl auf der Inhaltsebene als auch formal, der Technik zu Liebe. Mal sehen wie viele meiner Religionslehrer und EthikKollegen bei dir vorbeischauen. This is a fantastic piece of “Folk Art”. While I am sure many “traditional” Roman Catholics will be outraged, those who hold to the spirit of Vatican II and not indoctrinated by the papacies of John Paul II and Benedict XVI will appreciate it. Brilliant!!! As a person with a fondness for language, I am almost as impressed with this exquisite blog post about the process. But the art wins!! Thank you for bringing your genius to Milwaukee. 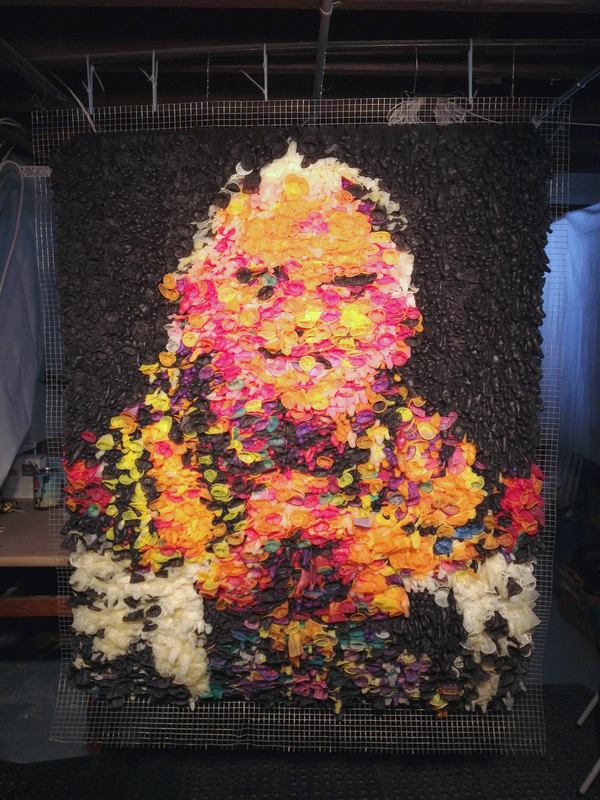 Next up… A portrait of Rembert Weakland, made out of hearing aids. I agree with all the other commentators. I love the statement. I love your diligence, exactitude and perspicaciousness of your approach! Well done! fantastic- your portrait- and your writings about your process are remarkable. A true testament to the power of art! Thank you so much. Very intresting work of art! 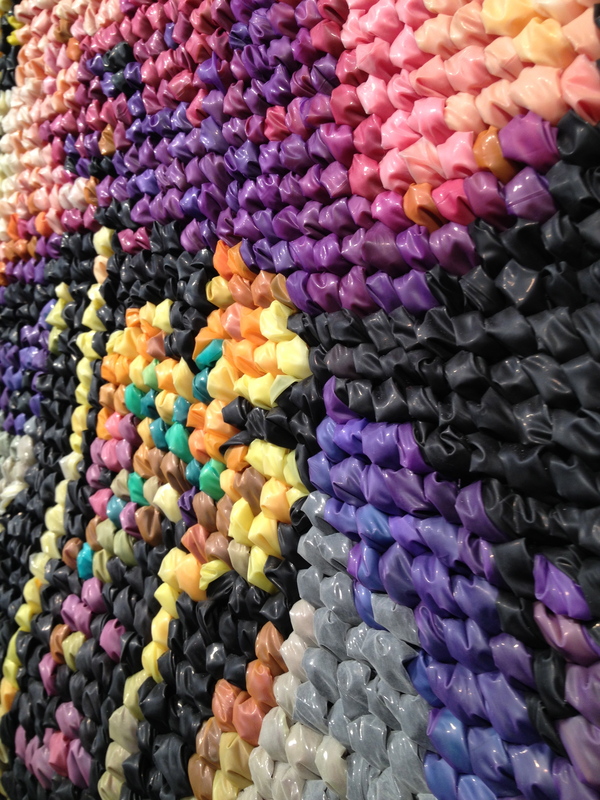 Love the visionary idea of this work and respect the diligence it took for you to complete this! Love the controversy it evokes! Congratulations! Cheers from another artist living in Shorewood,proud of your efforts! as being a catholic this the best art work i have seen to present the hipocricy of the pope and the church. since all the atrocities have come to light. i have suspended my participation and financial support. You are very talented and thank you for your work, it clearly sends a message. Delightful comment on centuries-out-of-date ideology. Posting about it at the blogs I edit/admin.